﻿ Kothari Wheels Wakdewadi,pune MH - Vahicle Purchase Rate Different From Customer To Customer ,simply Fraud. Home > kothari wheels wakdewadi,pune MH > kothari wheels wakdewadi,pune MH - Vahicle purchase rate different from customer to customer ,simply fraud. kothari wheels wakdewadi,pune MH - Vahicle purchase rate different from customer to customer ,simply fraud. 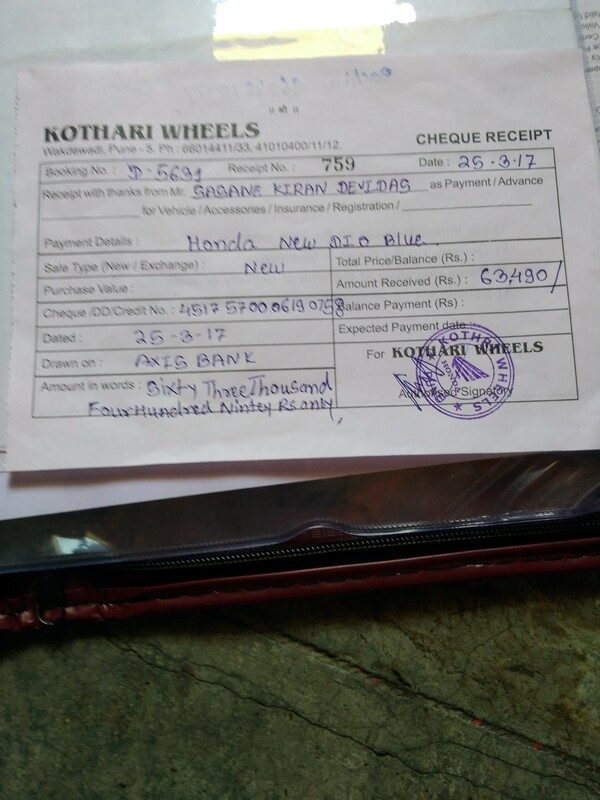 sir i have purchase a honda dio scooter from KOTHARI WHEELS WAKDEWADI.PUNE on date 25/03/2017,and paid full amount of rupees 65,077 [sixty five thousand and seventy seven].but the dealer gives me a recept of rupees 63,490 [sixty three thousand and four hundred ninety] 2)the dealer i.e kothari wheels not submitted my pepers of registration of vehicle to rto pune on next 2 or 3 days, in between that days supreme court issue a order not to register any BS3 Vehicle from date 01/04/2017.so the companies like HONDA,HERO ETC decreases prices of their bs3 make vahicles from date 27/03/2017 and gives 18000 to 20000 discount to customers. as the scooter i have purchase also bs3 vehicles ,so elligible for 20000,[twenty thousand ]rupees discount.but the dealer kothari wheels not return my 20000 rupees .as mention in origional invoice of vehicle. 3)if the dealer submitted my registration peper to concern rto pune before court order then i have not claim any discount,but he was presented my vehicle registration peper to rto on date 31/03/2017,that is after decleration of discount by vehicle manufacturing companies.so i strongly claim rupees 20000 discount return back which was clearly mention in my purchase invoice.